Audi, the German luxury car manufacturer, today announced the launch of the much awaited luxury convertible – the new Audi A3 Cabriolet. The low weight, elegant yet sporty four seater convertible is an absolute head turner on all the roads it travels. The latest variant of the Audi A3 Cabriolet which boasts of lightweight construction, offers best-in-class safety, comfort and performance. The new Audi A3 Cabriolet is priced at INR 47,98,000 ex-showroom Delhi. said Mr Rahil Ansari, Head, Audi India. Audi A3 Cabriolet comes with1.4l TFSI Cylinder on Demand (COD) engine, which enables temporary cylinder shut-off when the engine is operating at partial load. The TFSI engine with 1,395 cm3 displacement affords 110 kW (150 hp) of power and develops 250 Nm of torque. Audi’s latest TFSI engine supercedes the industry’s benchmark of average fuel consumption of 19.20 km/l by delivering high fuel economy and extraordinary sustainability, thus paving the way for the technological DNA of today’s A3 Cabriolet. The Audi A3 Cabriolet is distinguished by its sporty and elegant proportions. In addition to the lightweight cloth top, an acoustic top with very effective noise insulation is available as an option. Its electrohydraulic drive raises or lowers the hood even at speeds up to 50 km/h (31.1 mph). The designers have given the new Audi A3 Cabriolet even sportier, more expressive body lines. 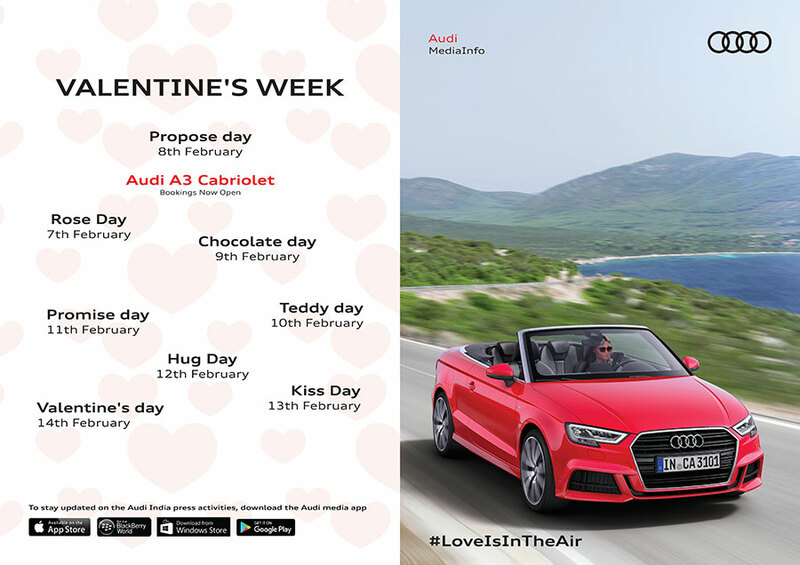 The Audi A3 Cabriolet measures 4,423 millimetres in length, 1,793 millimetres in width and 1,409 millimetres in height. The long wheelbase of 2,595 millimetres and the short front overhang underscore the balanced, sporty proportions. The powerfully sculpted engine hood and the harmoniously integrated bumpers form a visual unit, while the horizontal lines are emphasized even more. The Singleframe grill has sharper contours and is wider than its predecessor. The headlights of the Audi A3 Cabriolet form an impressive new lighting graphics with their jagged bottom edges. The LED headlights lend new verve to the dynamic lines as a specific daytime running light signature. The A3 Cabriolet also has newly redesigned rear lights with a distinctive taillight configuration. In addition to the LED, the dynamic turn signals are installed in the LED rear lights. 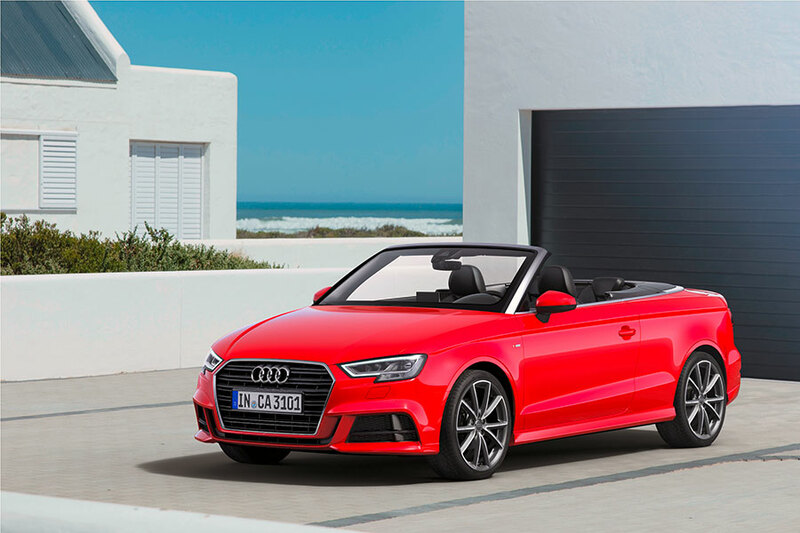 The sporty and clear body lines of the exterior can also be found in the interior of the new A3 Cabriolet – it features a newly designed three-spoke multifunction steering wheel, lender and flat instrument panel, and the centre console with its lightweight appearance is turned towards the driver. A technical highlight of the standard equipment is the electrically retractable MMI screen with 7-inch colour display, which is only 11millimeters thick. The four large, round air vents with a jet design have been revised. The seats are crafted in superior Milano Leather upholstery. In infotainment, the new Audi A3 Cabriolet again sets new standards. The MMI navigation with the electrically retractable seven-inch monitor is standard equipment. In addition to Audi phone box as standard, Dual Zone Air conditioning with sun-light dependent control, Audi parking system plus with both front and rear sensors and a rearview camera, optional smartphone interface, five airbags, ABS with EBD and optional Bang and Olufsen sound system, the new Audi A3 Cabriolet is a perfect blend of luxury and comfort.